FARMINGTON — Mt. 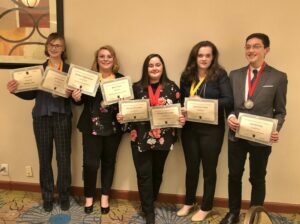 Blue High School Future Business Leaders of America (FBLA) members attended the State FBLA Leadership Conference March 18 and 19 in Portland. During the conference, students had the opportunity to compete against students from all over Maine in different business categories, and also participated in several workshops. The following students from Mt. Blue High School placed in the state competitions: Emmalee Clark, third place in Client Services; Eleanor DeCarolis, second place in Health Care Administration; Eleanor DeCarolis, second place in Insurance and Risk Management; Charles Eng, second place in Introduction to Business; Julia Hatch, second place in Advertising; Julia Hatch, third place in Agribusiness; Rena Voter, third place and a $500 scholarship in Banking and Financial Systems and Rena Voter, second place in Scrapbook.